To build awareness of the problems that are caused by garbage left on the beaches and implement activities to alter the population and tourists' behavior so that they do not throw waste on the beach. 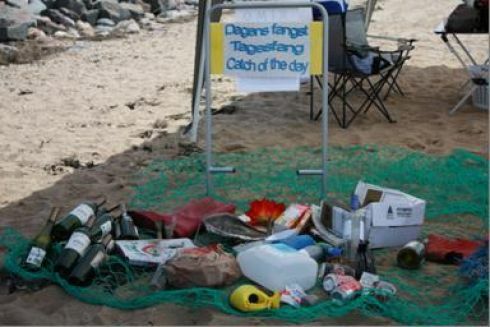 A humorous sign campaign on selected beaches in Denmark was carried out by Keep Denmark Clean during the summer of 2011. An awareness campaign for cottage guests in the entire Danish holiday destination was conducted throughout the summer. KIMO Denmark collected the waste thrown on the beach and displayed it to the public along with pictures of how the garbage affects beach users and sea life. This was carried out on 3 west coast beaches in 2011 and 4 west coast beaches in 2012. Both litter from land sources and marine litter was displayed. A top 10 list of the most frequent items was presented. 2013 summer season is planned (KIMO Denmark). Municipalities / Public that use the beaches / People who live by the beaches. KIMO - Own financing and from funding (Outdoor fund)Keep Denmark Clean had partnerships with:Blue flag Denmark, Frisko Is (a private ice cream company), The coastal lifeguard service of Northern Sealand and funding from “Trygfondens Kystlivredning” (coastal safety fund). Social Awareness many interactions with the general public and through the media. Good response from both visitors and media coverage.